This table design and other decorations may look labor intense and expensive to pull off, but it was actually the opposite! The first touch of Easter that I added was to simply swag my chandelier with this absolute steal of a garland from Target—it’s only $ 9.99! The luxe look of the velvet ribbon garland (shown above) has the look of garlands I’ve seen in gift stores for 4 to 5 times that! Note: My chandelier is on the large side so I needed 2 in order to achieve the look I wanted, and I ended up trimming 4 off the end. If you also end up with extra, set them aside like I did for later use with the centerpiece. The basic table consists of a classic white tablecloth (mine is linen ), woven chargers, patterned china, simple wine and water goblets, silver flatware and monogrammed napkins. I list out all sources later on. The entire centerpiece and additional items probably took less than an hour total to do and everything is available at Target, Hobby Lobby and your local grocery store or florist. I’ll walk you through the easy steps shortly. Lightly foiled pastel egg garlands added a lovely, soft touch! I used 2 Target egg garlands, one in the centerpiece and one on my side cabinet (above). Also on the cabinet is the coordinating Target Happy Easter banner which I particularly liked because the letters are wooden instead of the usual heavy paper style. It’s another bargain at just $ 9.99! Tuck the ends of Joanna Gaines’ Eucalyptus Garland under and secure with wire or fishing line. Place the Garland in the center of your table from one end to the other, curving it a bit so that it’s not stiff looking. Weave the Egg Garland around the Eucalyptus Garland and tuck the strings in a bit here and there. 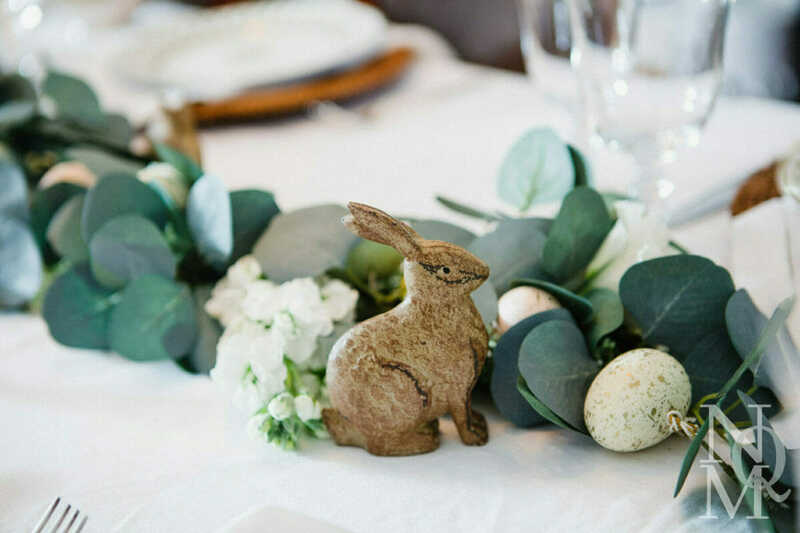 Add a few matching rabbits to the garland for a little extra Easter touch. I loved the Brown Rustic Rabbits I found at Hobby Lobby and got 4 of the ‘sitting’ and 3 ‘crouching’ so give a bit of variation. They’re out of stock online but your local store may have them still. Any similar rabbits will work well or you could opt for gold foil chocolate bunnies too. Place any left over velvet tassels from the garland (used on your chandelier) at the ends of the garland tucking the strings under the greenery such that it looks like the tassels are part of the garland. You can stop at this point if you wish, or if like me, you’d like to add a few fresh flowers to the garland, simply tuck a few trimmed stems in here and there. I wanted to keep with the crisp white look of the linens so I chose around 7 stems of white flowers but you could also opt for pastels picking up the egg colors. If you need the blooms to last more than a couple of hours, ask your florist for water tubes to keep them fresh. Note: I also removed some of the artificial blossoms on the Eucalyptus Garland here and there as I felt like there were just a few too many for my taste. And there you have it! Quick yet elegant table setting ideas! From all of us at No Qualms Mom, we wish you and your family a wonderful Easter!